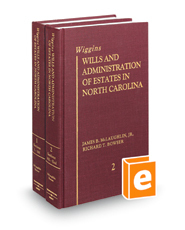 This edition provides the you with a history of the evolution of probate law, statutory and case law on the subject, analysis of legislative changes, and discussion of areas of antiquity in the present law that hinder the functioning of the probate court and the settlement of estates. In addition, this set covers some of the more fundamental rules of law dealing with the areas of federal, state, and local taxes. Content includes history of wills, holographic wills, nuncupative wills, testamentary capacity, undue influence, fraud and mistake, execution of wills, attestation of wills, revocation of wills, probate, and devises.